Betsy DeVos has attacked public schools and lobbied on behalf of for-profit schools, putting profits ahead of education for America's children. She's nominated for Secretary of Education in Trump's cabinet of bankers, billionaires and bigots, and her confirmation vote is scheduled for Tuesday, January 31. DeVos would be an unqualified disaster for students and families in all our communities, and people across America are mobilizing to stop her confirmation. We've already slowed her down with public outcry, and several Republican Senators are rumored to be wavering. We're going keep fighting -- by going directly to Senators' offices. 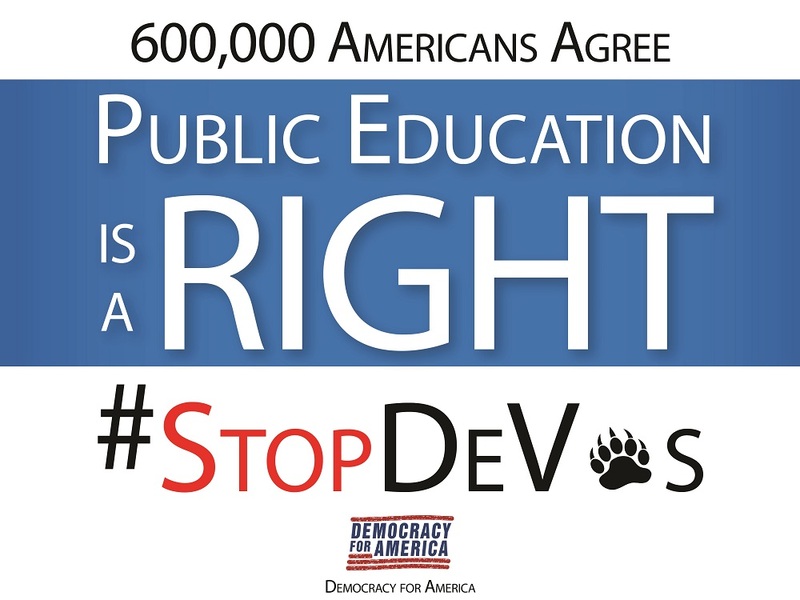 Last month Democracy for America members joined a progressive coalition to demand Senators block DeVos and other Trump cabinet picks. More than 600,000 people signed that petition. Now it's time to deliver those signatures to your Senators -- and tell them you expect them to oppose Trump's billionaire and bigoted Cabinet picks. DFA members are going to Senators' offices Tuesday, January 31. Can you join them -- and help stop DeVos? Note: Several newly elected Senators do not have offices set up yet, and may not be listed here.